Other Common Names: Blue Bells of Scotland, thimbles, lady’s thimble, witches’ bells and round-leaved bellflower. Harebells have bell-shaped purple flowers with five pointed lobes at the tips of each flower. They bloom on thick stalks, from which grow long, thin grass-like leaves. At the base of the plant are small rounded leaves. Harebells reach a height of only 15–45 cm at maturity. Despite their small size, each plant produces an abundance of flowers, though perhaps not as much at greater altitudes and farther north. Range: It is native to the planet’s northern hemisphere, including the United States, Europe and Asia. Here in Canada you may come across harebells at varying elevations in open fields, rocky areas, meadows and shorelines of Yukon, Northwest Territories and British Columbia across the country to the Atlantic provinces (though not thought to be native to Prince Edward Island). Habitat: Harebells can be seen at varying elevations in open fields, rocky areas, meadows and shorelines. These flowers are a food source for hummingbirds, insect pollinators such as butterflies and bees, and other beneficial insects. Here at the CWF demonstration gardens, tucked in between large rocks, native anemones and wild ginger, grows a dainty little plant that could easily be overlooked, except for its profusion of flowers. With rich purple blooms, Campanula rotundifolia catches the eye from June right up to the end of September when the trees are dropping leaves and most other flowers have already gone to seed. This perennial has many common names, including harebell, Blue Bells of Scotland, thimbles, lady’s thimble, witches’ bells and round-leaved bellflower. The latter, as well as the Latin word “rotundifolia,” both refer to its lower leaves, which are small and round. Harebells easily self-sow. When seed capsules are plump and green, watch them daily as they will soon ripen and explode with lots of tiny brown seeds. You can also try picking them when they just begin to turn brown and let them ripen indoors in a paper bag. They typically germinate well from seed. Scatter the seeds on top of warm soil and then sprinkle a thin layer of soil over top. You can also try making new plants by layering the stems of existing ones. This encourages the plant to keep its existing roots while developing roots at another part of the stem, thereby, allowing you to split the original plant into two separate plants. To do this remove leaves from the lower part of a stem and place this part on the soil. Cover with about 2” of earth and prop up the top of the plant to keep it vertical. The stem will grow new roots at which point you can sever it from the main plant. Campanulas are pretty easy to care for once established. At CWF they grow at the front of our shade garden among the large stones that border it. There they enjoy light shade and rich soil. We also have a clump growing in full sun in our Hummingbird Bed. While in both areas the plants are healthy and bloom in profusion, the harebells that get more sun are more upright, probably because of the extra light. Harebells can tolerate a variety of soils and so may also work well in rock gardens and on slopes. While some say they can spread easily, they don’t do it very quickly compared with some other plants in our garden, such as Ratibida pinnata, ostrich fern or Canada anemone, which we need to thin out each year. We’ve never yet thinned out our Campanula and instead let it have a little room to roam. Harebells are deer resistant, which means they are not a preferred snack of these large mammals. This can vary somewhat depending on where you live, the recent weather and how rumbly a deer’s tummy is. 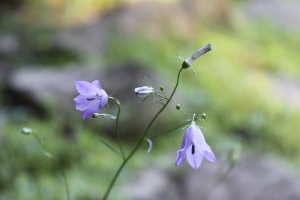 There are some other Campanulas found in the Canadian wild, but many are naturalized from Europe such as Campanula trachelium, which grows tall (40–60 cm) with its flowers blooming along the upper stem. Others, like Campanula Americana, a tall bellflower that is gaining in gardening circles, are true natives. Campanula Americana is taller—up to 2 metres—and grows in rich moist woods, thickets and forest edges from Ontario to New Brunswick. Although an annual or biennial, it self-sows easily. Its rich purple flowers bloom along the stem in the leaf axis. It is also referred to as Campanulastrum americanum. Another native is the less showy Campanula aparinoides, the marsh bellflower (previously called C. uliginosa). It prefers wet meadows, marshes and shores from Ontario to New Brunswick (not known in Newfoundland and Labrador, Nova Scotia or Prince Edward Island) and has smaller, paler and sometimes fewer flowers, and is less suited to the typical garden. Campanula rariflorum is a species that graces the valleys and foothills of southern British Columbia in moist open areas. Two especially northern species are Campanula aurita, which grows in rock crevices in Yukon, Northwest Territories and northern British Columbia, and Campanula uniflora, found in Yukon, Northwest Territories, Nunavut and northern Quebec along stony and grassy places.